Like most cats, Scout doesn’t like a lot of change in her life, but she’s had to adapt to quite a lot since December. First her beloved Templeton died early that month, then two strange kittens showed up at the end of the month. While she wasn’t happy at their presence when they were kept in isolation, she quickly warmed up once they were all in the house together. She bonded quickest with Sam, the youngest, but was more on friendly but cool terms with Emma. Over the months though she’s opened more and more to Emma, and lately I’ve noticed Scout specifically get up and lay down near Emma. This is one such occasion, she had been sleeping in one of the chairs in my office but got up to join Emma on the carpet. It was all I could do to not pick up Scout and give her a hug, but that’s one thing that hasn’t changed — as affectionate as Scout is, she hates to be picked up — so I let sleeping cats lie. 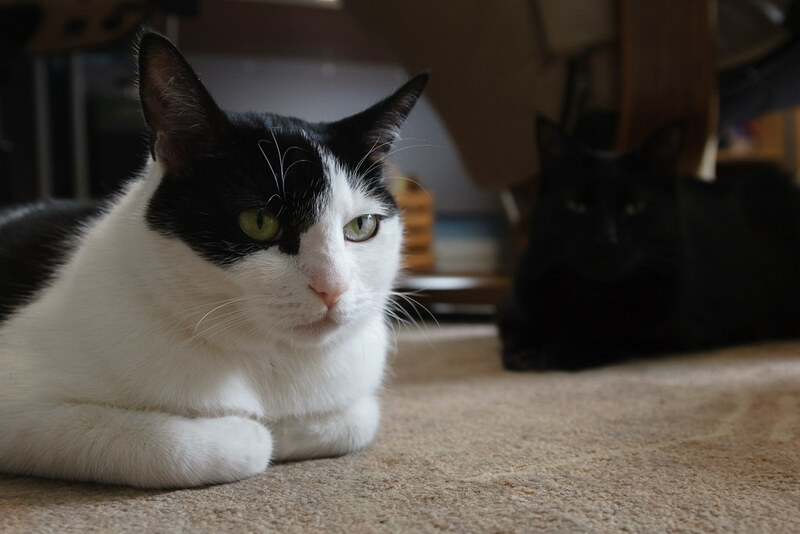 This entry was posted in Pets and tagged black cat, black-and-white cat, cat, Emma, resting, Scout. Bookmark the permalink.